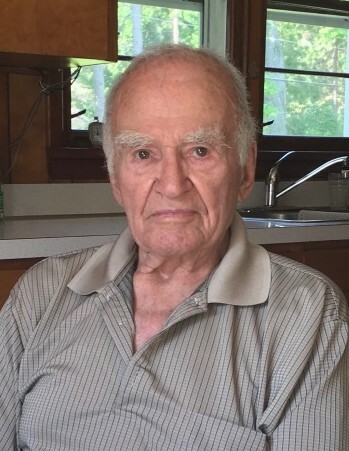 Robert E. Lee, 96 of Mancelona passed away February 10, 2019 at McLaren Northern Michigan in Petoskey. He was born September 30, 1922 in Pellston the son of Robert and Virgie (Barrow) Lee. Robert proudly served in the US Army during WWII and he was a member of the American Legion and VFW. He was a trucker all his life working for Gulf and Western and retiring from Dura Automotive. In his retirement years he drove truck for Virgil LaVanway trucking. In his free time Robert enjoyed camping, especially with his grandkids at 3C Bridge. He also enjoyed fishing and hunting in his younger years. On December 16, 1942 in Mancelona he married Donna (Holderman) Lee who preceded him in death in 2012. Also preceding him in death were his parents and many brothers and sisters. Surviving are his children Marie (Larry) Hamblin of Mancelona, Robert (Sherry) Lee of Mancelona, Donald Lee of Bellaire, sister Lois Rudapaugh, grandchildren RaeAnn (Burt) Thompson, James (Chandra) Hamblin, Amanda Lee, Tishia Lee, Melissa Lee, great grandchildren Caleb, Cooper, Riley, Isabelle, Trevor (Tommy), and several nieces and nephews. A memorial service will be held Monday, May 6 at 12 Noon at the Mancelona Chapel of Mortensen Funeral Homes. The family will receive friends from 11 a.m. until the time of service. Interment with military honors will follow in Fairview Cemetery. There's still time to send flowers to the Visitation at the Mancelona Chapel from 11:00 AM to 12:00 PM on May 6, 2019.